In the last print issue, we experimented with a different kind of review done in the form of a dialogue between two film connoisseurs, and it pleased us so much that we’ve decided to make it a permanent feature. 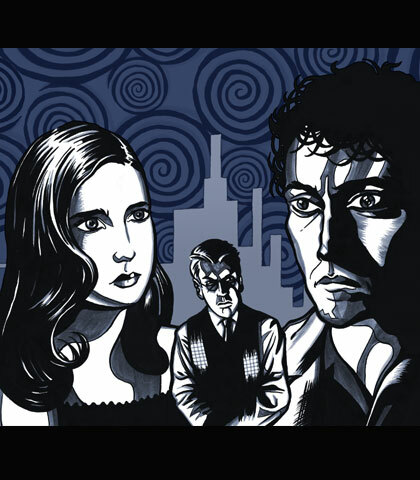 Here, ALEX FITCH and illustrator TOM HUMBERSTONE discuss Alex Proyas’s sci-fi film noir Dark City, which, just like last issue’s Paranoia Agent, is a story about unreliable narrators and shifting ‘truths’, making it perfectly suited to the dialogue treatment. Rarely seen but surprisingly influential, Dark City is a 1940s-style murder mystery set in an eerie futuristic city where it is perennially night and mysterious black-clad Strangers control the lives of the inhabitants. In this world, John Murdoch (Rufus Sewell) awakens one day to find himself on the run, accused of a murder he doesn’t remember committing, forced to roam the perilous streets of the city trying to find a way of distinguishing reality from dreams. Dark City has recently been released on DVD and Blu-ray Disc in the form of a new ‘director’s cut’. Alex Fitch: You told me recently that Dark City was one of your favourite films. Tom Humberstone: Well, it’s science fiction, speculative fiction at its purest… When speculative fiction is done right, you can really relate to it. AF: I think Dark City is a complete masterpiece, and yet somehow it’s this undiscovered gem. At the time Leonard Maltin, who’s one of America’s most respected film critics, chose it as his film of the year, and yet here we are, 10 years on, and hardly anyone’s heard of it. I wonder why The Matrix is so much more successful? Is it just that you can explain it in a sentence? ‘The reason Keanu Reeves can manipulate reality in The Matrix is because it’s a computer simulation and he’s a hacker’, while if you try to explain why Rufus Sewell can manipulate reality in Dark City, it takes a paragraph rather than a sentence! Do you think it’s as simple as that? Because in every other aspect, Dark City‘s better. TH: The Matrix wears its ‘Philosophy for Dummies’ badge on its sleeve, but with Dark City you have to read between the lines and work a bit harder to see what it’s saying about the human condition. It also says a lot more about cities; I’ve lived in London all my life, I think that’s part of the reason Dark City appeals to me – its inescapable cityscape that you can never truly get out of. AF: Dark City also has similar scenes to The Truman Show. When Murdoch travels geographically to the end of his journey, to find ‘Shell Beach’, it’s just a painting on a wall, it’s not really there. In The Truman Show, when Truman gets in a boat and travels across the ‘ocean’ to escape, he comes across a painting on a wall; and the only way to escape is to go to the reality on the other side of that wall. It’s interesting that the two characters find themselves in similar traps, which are controlled by deities that have a very profound and obvious effect on their lives. TH: Right, and in Dark City, when Murdoch finds out the truth and gains the ultimate power, he effectively takes the place of the alien overlords; so you wonder whether he can deal with that, considering he doesn’t know who he really is. You’re left kind of uneasy about it. AF: I’ve just watched the director’s cut and they let that moment play a bit longer so it’s more ambiguous – you think for a moment, maybe he is going to destroy the world, maybe the process has made him as evil as the alien rulers are. There are all these hints in the director’s cut that he’s becoming more like the Strangers. AF: …it’s such sabotage! It’s like if you opened The Matrix with someone saying: ‘It’s the far future, humanity has been placed into booths where they’ve been hooked up to a virtual reality which makes them believe they’re in 1990s Sydney’. It would destroy the movie! AF: Another theme of the movie is the nature of memory – the way you have these little artefacts of what actually happened in the past, your memory not being as clear as your photos of it. TH: Films are structured like dreams – time doesn’t pass in the same way for example. In real life we don’t ever have a chance to cut time, to cut from one scene to another other than in dreams. AF: In Dark City, it’s like Murdoch becomes aware that he’s in a film that’s like a dream. There’s one line that he has: ‘Do you remember it being daytime? How can it be night again? How can it be midnight again?’ And logically, if a character in a film asks that, it’s like he’s become aware that he’s in a film! TH: Yeah, I really love that line as well because you’re watching this city surrounded by complete blackness and you don’t ever really question it. You think it’s just part of the style, the director has just chosen to skip scenes set in daylight; but as soon as it’s pointed out, the fact that there’s no sun becomes a plot point… It’s fairly meta-textual! Interesting conversation/observations. To me this film is one of the most straight up allegorical tales ever made. The Dark City is the dark ages. John is anyman, dropped naked from his watery womb like us into a cold forbidding world he didn’t ask to be in. The powers that be attempt to introduce into him a form of original sin (that he’s a murderer) but he avoids this indoctrination. Because of this his mind is unencumbered and he’s free to seek the truth. He becomes a Galileo figure and The Strangers (the church) see him as a threat and attempt to do away with him. Long allegory short, he persists and eventually breaks through the shell (beach) of ignorance and becomes enlightened as to the truth (enlightenment here in one of the more heavy handed metaphors arrives in the form of the sun). John’s truth, identical to Galileo’s (that we’re floating on some nondescript sphere in a lonely corner of the vast universe, which means we’re not what we’ve been told we are) is cold comfort indeed, but enlightenment (in the Western sense) nonetheless. Once enlightenment is attained archaic thinking and those that espouse it (the strangers) begin to fade away and humanity enters a new age where we’ll control our own destiny.